(Guest Post) Most of us enjoy eating duck in restaurants, but why not try making your own delicious crispy duck with homemade plum and apricot sauce? It’s easy to cook so won’t get you too hot in the kitchen. If you are interested, read on! 1 tablespoon of groundnut oil, 2 duck breasts, skin scored in a criss-cross pattern and salad leaves to serve. 1 tablespoon of light soy sauce, 1 tablespoon of dark soy sauce, 4 tablespoons of grated fresh root ginger, 2 tablespoons of dry sherry or Shaoxing rice wine, 6 whole star anise, 2 tablespoons of ground Sichuan peppercorns and an optional pinch of salt to taste. For the plum and apricot sauce: juice from 1 lime, 1 whole star anise, 1 cinnamon stick, 1 tablespoon of honey, 100ml or 3½fl oz water, 2oz or 50g of chopped dried apricots, 2 plums with their stones removed and quartered and 2½ tablespoons of caster sugar. Start with the marinade by placing all the ingredients for the marinade into a bowl and whisk well to mix. Next, for the duck, place the marinade into a bowl with the duck and cover with cling film. Leave to marinate in the fridge for around 25 minutes and preheat the oven to Gas 6/400F/200C. Heat your wok until it’s smoking and add the groundnut oil. Add the duck skin side down and fry between 4-5 minutes until the skin is brown and crisp. Skin side up, transfer the duck onto a baking tray and cook in the oven for 3-4 minutes, or until cooked to your taste. To make the plum and apricot sauce, put the water into a small saucepan and boil. Then add the cinnamon stick, honey, sugar, plums, apricots and star anise and cook on a medium heat until reduce to a sticky sauce. Take the pan off the heat and strain through a sieve to discard the spices and mix in the lime juice. Now the duck is ready to serve with the sauce poured over it, alongside the salad. This recipe serves 2 people and only takes 30 minutes to prepare and 30 minutes to cook! It’s mouth-watering good, let us know what you think and how you get on in the kitchen. Now this would make me try duck! Have never had the pleasure looks great! Never would have attempted this, but so doable the way you explain it! Chinese food has always been a goal of mine to master, maybe this is the beginning! Claudia, glad u like it! Jen, I'm really looking fwd to your trial! Sandi, thks for dropping by! I'll pop by soon. Michelle, delighted that u like this post. Looking fwd to more sharing! I simply love chicken in plum sauce. This one sounds a great combination. Your title - crispy duck - makes me very excited. Homemade double the excitement. Reading this confirmed it - a must try recipe. Thanks for sharing. The opening picture to this post made my mouth water! I can't believe it's so easy to prepare, a definite must-try for me ;) Thank you for sharing this with us, Shirley! Isaac, thks for dropping by! Shirley, great to see u back in action! Doris, makes me drool too! LOL! Chichi, delighted that u like this too! Have a good week ahead! Wow...your duck looks very delicious, Shirley! You can open a restaurant! 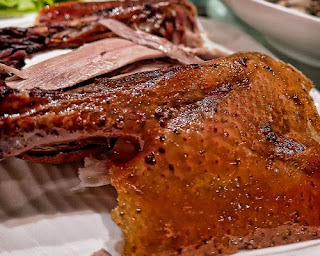 If I am there, I will go there and eat often :D I love roast duck. I am lucky a friend here is very good in roasting duck. She always give me one when she roasts...how lucky! One day when I move away from here, I will go to your blog to learn...hehe. Thanks very much for sharing. Hope you are having a great weekend. Crispy duck is one of my favorite things! I always thought to make a crispy duck is rather challenging but it looks like a piece of cake to you. Shirley I will definitely try making this and let you know if it is also a piece of cake for me or otherwise:D HUGS!! I adore duck, it sounds amazing with the marinade and the plum apricot sauce is just a perfect accompaniment. Veron, looks like there's quite a few duck fans here. Hahaha! Natasha, I'm sure this is chicken feet to u. U're one hell of a cook! I simply love this Shirley, its on top of my list of fav food. I simply love any kind of duck and this looks like perfection!! KF, thks so much! Yes, I enjoy cooking for family. Hubby adores my cooking. Heehee! When I was a kid, I used to love eating all the skin of the duck drumstick. Now I still love the skin, but I've also learned to love the meat too. This duck looks perfectly cooked till crispy and the sauce sounds wonderful. This is definitely making me crave for duck! Lequan, I'm like u eating only duck skin. Only difference is, I'm still doing that! Lol!